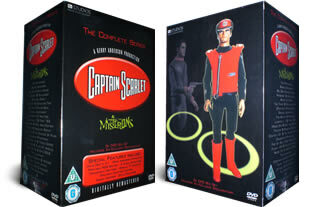 Captain Scarlet DVD box set. The complete 32 episodes on 6 dvd's. DELIVERED FREE IN THE UK. Captain Scarlet and the Mysterons is a British science-fiction television puppet series. Characters are presented in a form of marionette puppetry in a digitally-remastered format. Bonus disc contains interviews with directors and puppeteers. Product was perfectly packed and as mentioned on web site the full box set for a reasonable price I would recommend this product to any one.